The 4-H Livestock Club will meet at 6 p.m. on Monday, January 14 at the Extension Office. The 4-H Dog Club will meet from 6-7:30 p.m. on Tuesday, January 15 at the Extension Office (no dogs) and on Saturday from 1-2:30 p.m., January 19 with dogs at 100 Carter Brothers Rd. The 4-H Cloverbuds will meet on from 3:30-4:45 p.m. Tuesday, January 15 at the Extension Office. The Cloverbud program is for youth ages 5-8 years old or K-3rd grades. 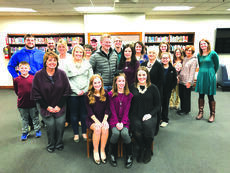 A sendoff for 2019 LaRue County Distinguished Young Woman Malerie Skaggs occurred last week, as she prepared to leave for a week of preparation at this year’s state DYW competition Skaggs received the first-place prize at the regional competition level on August 18, 2018 at LaRue County High School. The LaRue County Extension Office will re-open on Wednesday, January 2, 2019. The winter months are a great time to catch up on much needed family time. Yes, it’s cold. Yes, you cannot get outdoors as much, but around your home you have plenty of indoor activities to do with your children that can create a meaningful family experience and lots of wonderful memories. 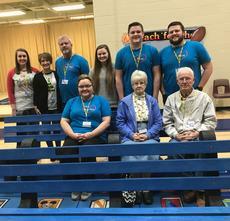 The hard work and perseverance of hundreds of students and their families and the overwhelming response of the LaRue County community culminated this past week with the dedication of the Mary Jane Stillwell Buddy Benches at the Abraham Lincoln Elementary School. Stillwell, a well respected and loved teacher assistant at ALES, died of cancer this past summer. The holidays are a wonderful time for family togetherness, but after a few days, everyone, no matter their age, begins to look for distractions. In a world of smart phones, tablets and laptops, our attention often turns to technology. But, it is possible to keep young people active and engaged without technology. Captain Jacob Van Meter Chapter, National Society Daughters of the American Revolution met December 14, 2018 at the Brown Pusey House in Elizabethtown. 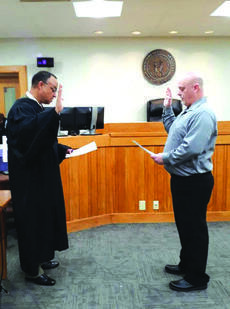 A new member ceremony welcomed four ladies: Lisa Highbaugh Greene, Shirlet Goodman McCamish, Charlene Wagner Stinger, and Debra Cox Williams.